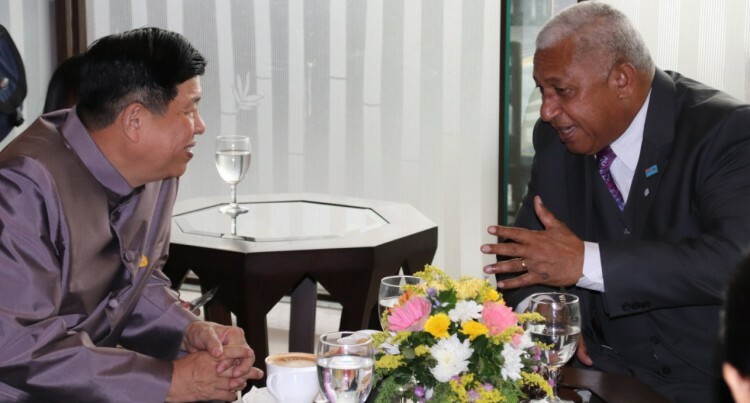 Speaking in Bangkok on Tuesday, Prime Minister and COP23 President Voreqe Bainimarama dispensed with the usual formalities and wasted no time delivering his message to the climate negotiators who are gathered this week for an extra session to make progress on the Paris Agreement Implementation Guidelines. “In three months’ time, we will be in Katowice, and frankly, we are not ready. I think we all know that we have not progressed far enough, which is why we are here in what we are calling an “additional” negotiating session. But it is not just an additional session; it is an urgent session. “Without Implementation Guidelines that everyone can live with, we risk chaos at Katowice and the possibility of yet another delay in the urgent work of combatting climate change,” the Prime Minister said. The Implementation Guidelines, referred to by some as the “Paris Rulebook,” are the details that will determine how the Paris Agreement works in practice. They address how countries will communicate, report, review, and strengthen climate action in line with their capabilities, in a way that is transparent and accountable to the international community. In 2015, countries agreed that they would be completed by COP24. However, that deadline is quickly approaching with much work still to do to produce a draft negotiating text that can be reviewed and finalised by ministers. “Our main task at COP24 is to agree on a package of decisions that will ensure the full implementation of the Paris Agreement. Our work in COP23 and throughout this year is essential to that goal. “It is our responsibility—and I use that term purposely—to agree on Implementation Guidelines. They form the roadmap that will allow us to get to those decisions,” the Prime Minister explained. “In these few days in Bangkok, we will have an opportunity to put the Paris Agreement on the path from words to action—to make it fully operational—and in doing so to build a springboard for the urgent additional climate action we need,” he added. However, the Prime Minister spoke plainly about the additional effort needed to turn good intentions into action. “In our global effort to confront climate change, tens of millions of words have been spoken, and nearly as many promises have been made to the people we represent,” Mr Bainimarama said. “Every nation now needs to make decisions that might be politically difficult. But that is why we were chosen to lead—because leaders do the hard work, make the hard decisions for the common good, and defend them,” he said. Mr Bainimarama concluded his remarks with words of encouragement, urging the negotiators to rediscover the spirit of leadership, co-operation and compromise that led to the historic Paris Agreement in 2015. During its meeting in Bangkok, the Bureau discussed strategy, joint efforts and initiatives to help reach a coherent and balanced draft negotiating text by the end of the session. On the sidelines of the meeting, the Prime Minister met with the incoming President of COP24, Michal Kurtyka. The Prime Minister extended his support to the COP24 President designate and said that the COP23 Presidency stands ready to assist in any way it can. He also met with the executive secretary of the UNFCCC, Patricia Espinosa, where the two agreed on the importance of the work ahead.